In today’s episode, I’m sharing The Hard Stuff from 2018. As we prepare for the year ahead it’s important to me that I’m fully transparent with you in the hopes it will help you in feeling seen, heard and understood. 2018 was a very difficult year, but it’s taught me some of the most important lessons that I will carry with me in the year ahead. It is my personal hope that 2019 brings more transparency in branding through the power of storytelling, and I’m starting right here with this episode. ↠ How my year started and the role it played in my business. ↠ Dealing with grief as an entrepreneur, mother, wife and woman. ↠ How my perfectionism challenged me in 2018 with the hiring of team and expanding my brand. ↠ One of the biggest mistakes I made in my business. ↠ My top tips for consistently growing in life and business. ↠ Removing the shame and guilt we feel as women. ↠ The single biggest lesson that keeps smacking me in the face. ↠ My goal for this brand in 2019! I’m so excited about today’s topic with today’s guest. My amazing Doula, cousin and friend, Tiffany Alblinger and I are having an intimate conversation about the freedom to design your own birth, to question “what’s always been done” and erasing the stigma around motherhood. I’m also sharing my own birth story from Cal’s home birth three years ago and the difficulties I faced postpartum. I believe MORE women should talk about these topics so we can all start to remove the shame often experienced by mothers everywhere. The freedom to chose your own birth experience. How Tiffany supports mothers from birth to postpartum all the way into motherhood. Tiffany’s top questions to ask before choosing a birth location. How to get support when you want to go against the norm in regards to your birth experience and your role as a mother. Removing the pressures and shame around motherhood and asking for support. Our hope for mothers everywhere! Tiffany Alblinger is a homeschool mom to daughters, homebirth midwife in San Diego and Co-founder of a give-back online mom shop called Whole Mother Co. She is creating community around women-centered topics and normalizing the struggles of motherhood while providing practical support for the journey. Whole Mother Co is a fun give-back mom shop that connects everyday motherhood to causes that directly support the empowerment of moms. The Whole Mother Level shirt donates $3 to Improving Birth, an organization that works to improve birth outcomes for moms and their babies. Today’s episode is a little impromptu because I think it’s needed! I’ve been watching so many entrepreneurs over the past year fly by the seat of their pants, and while I see incredible value in leading with inspiration, I also see too many entrepreneurs taking action from a place of desperation. My secret to avoiding this has always been planning. In today’s episode, I’m sharing how you can plan for 2019 starting today and set yourself up for major success in the new year. Speaking of planning, don’t forget the doors are now open to my signature program Roadmap to Freedom, but are closing soon! Roadmap to Freedom is my 6-month LIVE group program for the new female entrepreneur who is ready to launch an online business that allows her to make money on her own terms. It's for the woman who is tired of just guessing at creating her profitable business and wants to seriously start making sh*t happen! This program was designed to give you the COMPLETE roadmap, to remove the feeling of overwhelm and give you the support and accountability from someone who has been exactly where you are now so you can dig deeper than you could ever do on your own. What worked for you in 2018? What didn’t light you up or excited you? What did you accomplish or celebrate in 2018? Based on 2018, what’s on top of mind for 2019? What will you create or release in 2019? Visualize what you are doing in 10 years. What action can you take in 2019, that will get you closer to your goal? Where do you want to be by the end of 2019? How does this contribute to your 10-year vision? Now break down your main steps to get there into quarterly plans. What is your #1 focus for the year ahead? Decide on your Big 3 for the first 90 days. Create actionable and measurable steps to get you closer to those goals in the first 90 days (get specific with each month). Today’s guest is my friend Kait from Hello It Girl and a girl after my own heart. After our deep conversations, over wine and great food in Paris, I knew I needed to share her knowledge and message with you. On today’s episode, I’m excited to invite you to create your own definition of freedom and tap into what truly makes you feel authentic. It’s not about meeting someone else’s standards, it’s about knowing you are worthy exactly as you are in this moment. Kaitlin is a multi-passionate entrepreneur. She is the founder of the brand hello it girl and is your go-to source for lifestyle inspo, self-care and chic mindset shifts. She is the expert in helping you design a life that feels aligned and helping you find, and step into your inner it girl. In today’s episode, I’m having a real and pretty raw conversation with my dear friend and former coach, Jodi Bullock. You’ll learn more about my relationship with food and the major changes Jodi supported me in making Fall 2017. I just knew to celebrate one year of feeling FREAKING AWESOME, I had to have her on to support all of you. Jodi and I share the same passion for food AND what we are feeding our sons. I hope this episode inspires you to push back against tradition if it feels right for you and your family. As with every episode on the podcast, it is my intention for you to feel empowered to make changes in your life leading you to freedom. Speaking of freedom; hey did you like that segue?! Roadmap to Freedom is now open for enrollment. We’re currently in Early Bird pricing which means you save $1,000 off the regular price of the program, but only until November 30. Roadmap to Freedom is a 6-month transformational LIVE experience for the new and aspiring female entrepreneur ready to make money on her terms. It walks you through the four pillars to a thriving and profitable brand and business so you can start experiencing true time, financial and location freedom. Wondering how to build a community? We cover that! Not sure how to create content that converts? We cover that! Want to understand and utilize the social media tools are your fingertips? We cover that! Ready to master sales conversations? We cover that! Interested in signing high-level clients and launching courses? We cover that! This is a super passionate episode and I can’t wait for you to dive in. Please note if you need to make shifts in your diet please consult Jodi or a registered professional. 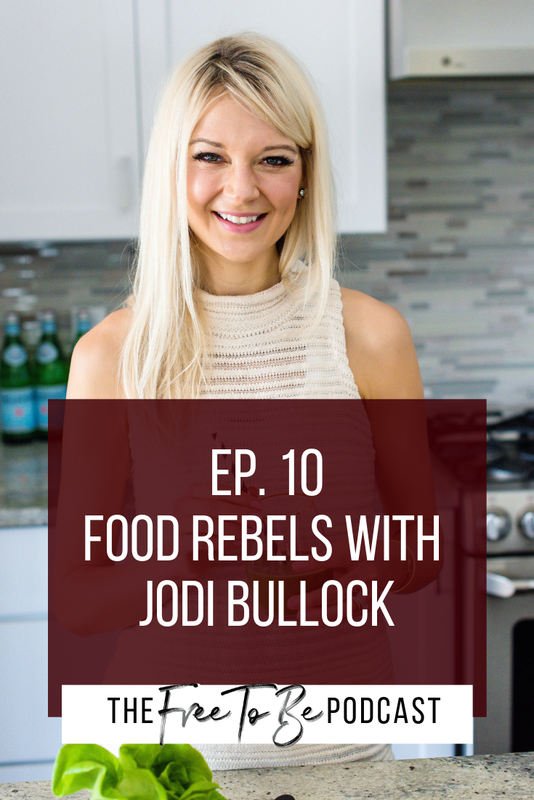 Jodi Bullock is a holistic health coach and consultant who uses the energetics of food and the body to show you how to create the healthiest version of yourself and is working to create large-scale changes in how we look at the food system so that our next generations learn how to eat.